If you're ever visiting Cincinnati during the dog days of summer, keep your eyes peeled for a fascinating non-native lizard scurrying over rock walls, darting across sidewalks, and lurking in landscaping. I've posted BYGL reports about these lizards in the past because the story of how they got to Cincinnati is so intriguing and their ascent to equal treatment amongst native reptiles is almost unprecedented for reptiles in Ohio. The lizard's common name is influenced by where you stand, literally. If you're an American herpetologist, you would call them European wall lizards (Podarcis muralis). If you live in Europe, they are common wall lizards. If you're a native Cincinnatian, you would likely call them "Lazarus lizards." The lizards are capable of shedding part of their tail to survive a predator's attack; a defense mechanism known as autotomy. The detached tail will continue to whip back and forth to further distract (bewilder?) a predator. A slight swelling of the tail often indicates where the old tail broke off and a new tale grew. In 1951, 10-year-old George Rau Jr., step-son of Fred Lazarus III, came across some common wall lizards scurrying across rocky slopes while on a family vacation to Lake Garda in northern Italy. George smuggled a few (6 to 10 depending on the reference source) through customs to release them at his family's home on Torrence Court located in the eastern Cincinnati suburb of Hyde Park. Some of the European expats thrived to eventually become so numerous that Torrence Court is still sometimes referred to as "Lizard Hill." Local residents called them "Lazarus lizards" in misplaced recognition of the lizard's perceived patrons. Of course, they should have been named "George's Lizards" in honor of their true sponsor. Research conducted by Cassandra Homan for her 2013 University of Cincinnati M.S. Thesis (see "More Information" below) added credibility to Rau's claim. She compared genetic samples collected from the Cincinnati lizards to samples taken from the reported source population in Europe and confirmed a substantial loss of genetic diversity indicating a genetic bottleneck. Her computer simulations suggested the bottleneck was likely associated with only three individuals surviving their release to become the founders of the Cincinnati populations. Indeed, the species has been so successful in colonizing southwest Ohio, it has achieved a rare status for a non-native. 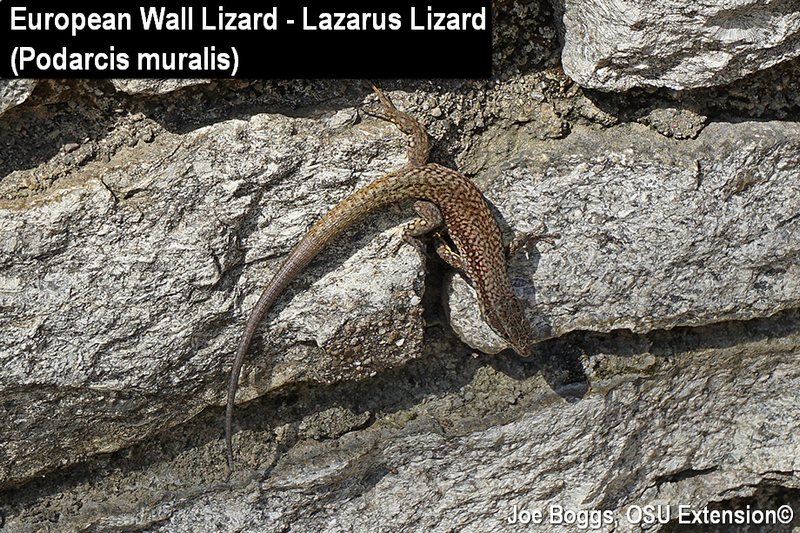 The "European wall lizard (Podarcis muralis)" is listed among the names of native reptiles in Chapter 1531: Division of Wildlife; 1531.01 Division of wildlife definitions. It is considered a "naturalized species" that is protected by law.